At this time all the schools of instruction will be completed. The last one was March 1, 2009 for North and East Central Pomona. There was much useful information given out at the schools. If your Master was not at one of them ask one of your members who was there or your Deputy to fill you in. One of the most important items was the National Grange V. Tyson Foods. Each Grange got a letter from National last year explaining this situation and at the schools of instruction I gave each Master a follow up on what their Grange should and should not be doing in regards to this. It was a handout and if your Grange did not receive one let me know and I will send one. The National Grange is soliciting financial help for this fight and I strongly urge any Grange that can, to contribute to this cause. I will bring back, from the Masters meeting in Arkansas, further information on this subject along with whatever National has set up for a media campaign. In the coming months, the Deputies will be scheduling evaluations for your Grange. You will be getting a question sheet to answer prior to the evaluation. This will help me to better understand your Grange. The procedure will be the same as last year. I strongly urge all Granges to continue their efforts to attract new members and use this opportunity to confer degrees on those members you have who may not have witnessed them yet. 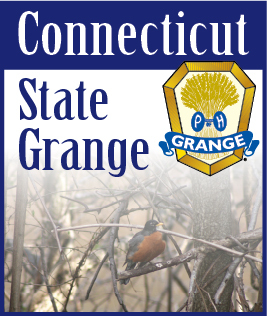 When National Grange held its annual session in Connecticut last year it generated much interest in the Grange here. You should now take advantage of that interest to build your Grange. Seize the opportunity. I want to continue to urge Pomona officers to visit and aid the Community Granges in their jurisdiction and it is especially important for State officers to do the same. You may not realize it but I know that Granges gladly welcome visitors. This may be the perfect time since there is not much else you can do in the cold of winter, so spread a little warmth and joy.